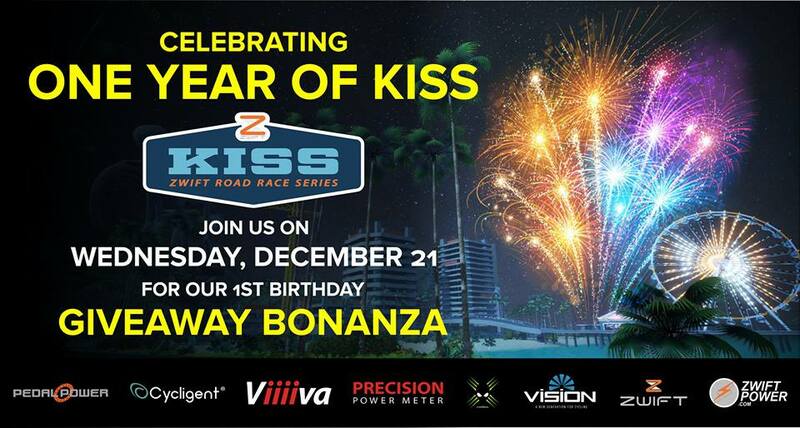 The hugely popular KISS Race Series is celebrating their first birthday with a KISS Birthday Bash this Wednesday 21st December at 8pm UTC. The race is a format known as an Australian Pursuit Race (APR). Unlike an ordinary road race, an APR is run as a handicap event. Held on Watopia’s Figure 8 route, groups of riders start at different time intervals based on ability. The first rider over the finishing line is the winner, so groups that start later must close the time gap to the leading groups in order to win the race. Racers will be separated into 6 groups based on your best segment time for the Watopia Figure of 8 Course (here is the Strava segment link). The event will be covered live by the awesome broadcast team that is Nathan Guerra and Jonny Noblett at www.beam.pro/NathanGuerra. KISS organizers have also arranged a bonanza giveaway! All racers who complete the race and are not disqualified based on race rules will qualify to go into the random drawing which includes fantastic prizes from 4iiii, PedalPower & Cycligent/Team Experimental. Opened in St Helier in 2004, PedalPower was created by 2 of Jersey’s avid racing cyclists spanning 2 generations. Jersey’s love and passion for cycling flourished through the shop providing products and service that the Island had been lacking. The Pedal Power team has grown over the years. We are mountain bikers, time trialists, and road bikers with experience in UCI European events, UK Premier Calendar series, Commonwealth and Island Games experience. Your Passion is Our Passion. As being used by Etixx – Quickstep World Pro Tour cycling team, reviewed by Titanium Geek and tested here at KISS HQ for the last 5 weeks, we are thrilled to offer the incredibly accurate 4iiii Precision Powermeter and the Viiiiva HRM ANT+ Bluetooth Bridge. These units have been very reliable, responsive, and comparable with other Powermeters in terms of accuracy. Along with the Viiiiva HRM you would be setup for either PC or iOS Zwifting. See www.4iiiiuk.com for further information about these 2 great products and other products available from 4iiii. Cycligent Cloud is web app bliss for developers, managers and users. Tthe first team ever to win on Zwift and won the TTT world champs this year with its honour before victory ethos. Team WBR‘s goals are to be a close knit team following our manifesto: to race hard, to improve Zwift, to help Zwifters get fit via our #ProStyleTraining group rides, to run Club WBR as a social training hub, and to raise awareness about our sponsors, especially World Bicycle Relief who bring Buffalo Bikes to help the world’s most in need of transport. Would be nice if the time bands were posted here as well. I am not part of the facebook group yet therefore I can’t see them. Thanks a lot. Do you have to put the group in your nickname somehow as with the Class tags usually used or just make sure yourself to start with the correct group. Will be interesting how this will work out. Agree! Please put the time bands somewhere public! I added the time bands to the post. The Zwift event writeup doesn’t say anything about adding a race tag to your name, so I suppose you can just ride with whatever name you’d like.